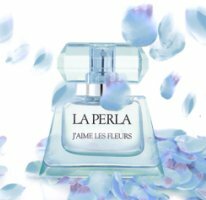 La Perla has launched J'aime Les Fleurs, a fruity floral follow-up to last year's J'aime fragrance for women. The fragrance notes include lemon, mandarin, apple blossom, watermelon, pineapple, cyclamen, rose, jasmine, water lily, ylang ylang, freesia, patchouli, sandalwood, amber, vanilla, benzoin and tonka bean. Miss Sixty will introduce Miss by Miss Sixty, a new fragrance for women, next month. The fruity floral scent is meant to be saucy and playful, but always in a refined and glamorous way. The fragrance notes feature frozen pear, melon, bergamot, magnolia, peony, waterlily, caramel, musk and nectarine. Ha, it went right over my head. Too true though!